#1: Let a designer coordinate your tradeshow booth design. Ncutt will work with your staff to ensure aesthetics, marketing needs, new product or innovation prominence, and technical requirements. #2: Remember, patrons come to learn! Let them browse or guide them while you are getting their contact info and give inexpensive sales literature with contact information. Only send catalogs as a follow-up to prospects. Permobil, a global wheel chair manufacturer, markets heavily at industry tradeshows. Permobil needed to stretch their marketing dollars so Ncutt designed a small brochure to literally and inexpensively rollout their full product line for broader distribution. 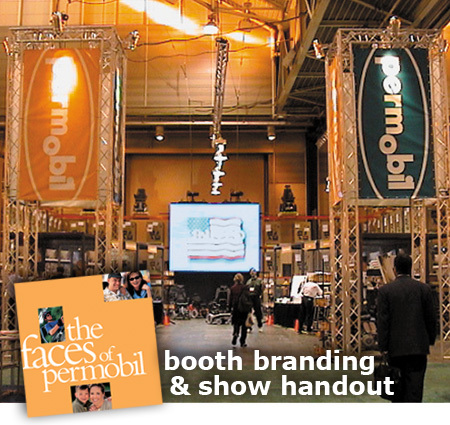 The colors chosen for the booth attracted attention and complemented Permobil’s logo. Nine video screens were used together to create a grand screen that ran a presentation that filled all screens at full scale and individual sequencing screens – the result was brilliant! creative value: Tradeshows help you connect with customers. Follow up.